Enjoy the beauty and comfort of a true wrought iron bench, built with the same qualities that made it popular in the 1800’s. Our Clear Creek Bench is an actual reproduction of the original wrought iron bench. It is not to be confused with molded ornamental cast iron benches. Wrought iron craftsmanship is time consuming and does not lend itself to mass production; it is rapidly becoming a forgotten art. At Wikco Industries, we have rekindled the elegance and beauty gained from wrought iron artistry. 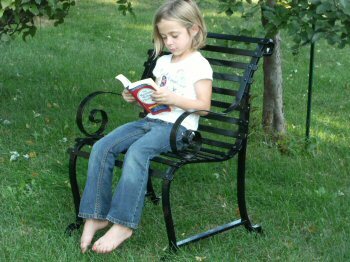 We carefully match each size and shape of iron to the unique curved design of the original wrought iron bench that was popular in parks and gardens at the turn of the century. All steel construction assures a lifetime of low maintenance, dependability and timeless beauty at a reasonable cost. You will appreciate the artistry and quality of Wikco craftsmanship, preferred every time to today’s mass produced furniture made from plastic and sheet metal. You will find this charm, comfort and durability only in the Clear Creek Bench. It is ideal for pools, patios, terraces, gardens or parks, as well as business or home recreation areas. * True copy of a handsome original over 100 years old. * Unique curved design gives stylistic beauty. * Seat and back are contoured for leisure comfort. * Parts are primed and painted with industrial enamel, assembled and then given an additional coat of industrial enamel. * All steel construction, gives durability for a lifetime. * Benches weigh 75 to 100 lbs. Chairs weigh 55 lbs. Fabrication... Frames are made from 1 1/4" inch channel, seat and back, 1 inch strap. Fastened by round head steel bolts. Color... White, black or green enamel. (other colors available) Shipping... Shipped by truck, fully assembled. 80-4 4Ft. Clear Creek Wrought Iron Bench $359.00 Plus Shipping. 80-5 5Ft. Clear Creek Wrought Iron Bench $379.00 Plus Shipping. 80-6 6Ft. Clear Creek Wrought Iron Bench $399.00 Plus Shipping. 80-C22 Clear Creek Wought Iron Chair $179.00 Plus Shipping. 80-4KT 4Ft. Clear Creek Wrought Iron Bench Kit (Un-finished / Un-assembled) $299.00 Plus Shipping. 80-5KT 5Ft. Clear Creek Wrought Iron Bench Kit (Un-finished / Un-assembled) $319.00 Plus Shipping. 80-6KT 6Ft. Clear Creek Wrought Iron Bench Kit (Un-finished / Un-assembled) $339.00 Plus Shipping. 80-C22KT Clear Creek Wrought Iron Chair Kit (Un-finished / Un-assembled) $139.00 Plus Shipping. Please Call Toll Free For A Shipping Quote To Your Destination. When this item is shipped by truck it is the responsibility of the consignee (buyer) to unload the freight from the back of the shipping truck. Unless the freight is delivered to a business address, it is highly recommended to pick the freight up at the trucking companies terminal. Additional charges apply for residential or non-commercial deliveries, and lift gate services. To Order Or For Shipping Quotes Call (800) 872 - 8864.